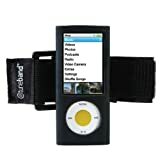 Grantwood Technology presents the tuneband armband for the iPod nano® 5th Generation. Based on Grantwood Technology's best selling tuneband for iPod nano®, the silicone skin is secure, thick and protective and allows access to all the ports on the iPod Nano®, including the new camera port. The tuneband has a comfortable stretchy Velcro® band that fits both large and small arms, if you need an extra small armband or extra large please contact us, as we have them available. Also, the tuneband comes with a low tack peel screen protector and click wheel protector. Finally, the tuneband is compatible with the Nike+iPod system and we are also the sellers of the original Shoe Pouch for Nike+iPod. If for any reason you are not 100% satisfied we will guarantee a replacement of your purchase or a refund. We stand by the our products and look forward to you becoming another happy customer. Note: Nike+iPod Sport Kit is sold separately. If you are unsure of which generation of iPod nano you own, please contact us.